My husband, Gary, and I have been best friends since we met in Sonoma County in 1984. Outdoor enthusiasts, we love to hike, bike, kayak, canoe, swim, backpack, cross country ski, and run (well, Gary still does that)! But we also enjoy attending the symphony, theater in San Francisco, and of course gourmet food! A fine artist, Gary loves the vibrant artistic community in Sonoma County, and he will share with you the secrets of where to visit artists working in their studios. He loves the quality of the light here and the beauty of the natural world. A psychotherapist and teacher, I appreciate the focus many people here have on personal growth, health, wellness, and consciousness-raising. As a writer, I love the quiet peaceful feel of the land. We have a son who owns a design and fabrication studio in Brooklyn, NY, and a daughter who works in advertising and marketing in Kansas City, MO. We were entranced with the beauty of the rolling, coastal hills, dotted with vineyards, apple orchards and dairy ranches. We love the versatility of this area. On any chosen day we can go to a gorgeous Sonoma Coast beach, walk through an old growth redwood forest, hike past thundering waterfalls to a viewpoint on a high ridge overlooking the ocean, mountain bike to swim in a lake, or backpack along the coast. But there are also artisans of all varieties, live music and theater, gourmet food, and boutique shopping. And to top it all off, the Sierras are only three hours away, and San Francisco is an hour down the road. Some of the best Sonoma County secrets we can direct you to are world renowned Osmosis Day Spa in a country setting, surrounded by bamboo and an immaculate Asian garden, our local organic bakery with brick ovens which makes the best bread this side of the Golden Gate Bridge, Safari West Wild Animal Park where you can ride a jeep to see everything from giraffes to cheetahs or hook this onto a bike ride through the vineyards, the best Sonoma County homemade ice cream at Screamin’ Mimi’s in Sebastopol, the roller coasters at Six Flags, the amazing California Carnivores, the largest carnivore plant nursery in North America, Silk Moon boutique where you will feel like a traveler in foreign lands, and wineries and bistros too numerous to mention by name here. Our stay was at Apple Blossom was wonderful. We enjoyed Gary and Susan. Our studio was very clean and well equiped. The country side was a welcoming site and very close to town. We would stay with them again. My partner and I stayed for a last minute-booked stay of 2 nights over New Years Eve to refresh from family fatigue over the holidays. The space is next door to the hosts residence, but very quiet and in a rural neighborhood, so it felt private. The space is big enough and comfy for reading or watching movies. The hot tub is large and helped with the relaxation. 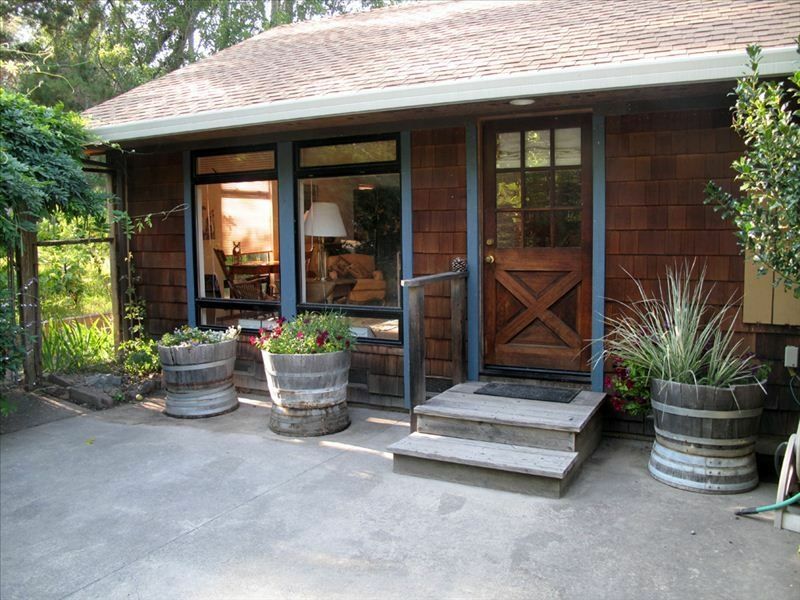 The location is great...an easy 10min drive to downtown Sebastabol, the coast, or the many cute towns of West Sonoma. The hosts were communicative and friendly, without being imposing. Wish we stayed longer! I spent a couple of days here to get away and have some time for myself to write, think and relax. This was a great place to do it: lovely views out all the windows, everything I needed in the mini-kitchen, great walking to be had right out the door. Susan and Gary were lovely hosts--available for questions when I had them (and to provide new batteries for the DVD remote! ), but discreetly distant otherwise. Very nice! This was the perfect place for us during a massive family reunion -- a place of peace to return to every night! The bed is wonderful and the nights so completely quiet. The kitchenette was just enough for me to cook every meal (a bit creative with only one burner, but very doable! ), and Susan and Gary were just incredibly welcoming and caring. Not to mention the glorious countryside and the vistas you pass going to town and back. We look forward to staying here again. The second visit was as good as the first !! This was our second year staying at Apple Blossom and we enjoyed it as much as the first. Susan and Gary gave us more suggestions of places to visit and hike, and we even found several new ones of our own. We are sure anyone will be as pleased as we were with our latest visit. Wineries, vineyards and tasting rooms offer ample opportunity to sample many appellations. Amazing beaches are 20 minutes away. Our state parks provide rugged coastlines, towering redwoods, waterfalls, and majestic views. Select fresh, organic produce at our many farmers’ markets and celebrate at the colorful, local seasonal festivals. We will direct you to art galleries, top rated restaurants, local boutiques and shops and we will even share a few of our secrets. And remember, San Francisco is only an hour away.